Mr Tarrant, who stood silently during the brief hearing, was remanded in custody without plea and is due appear in court again on 5 April. 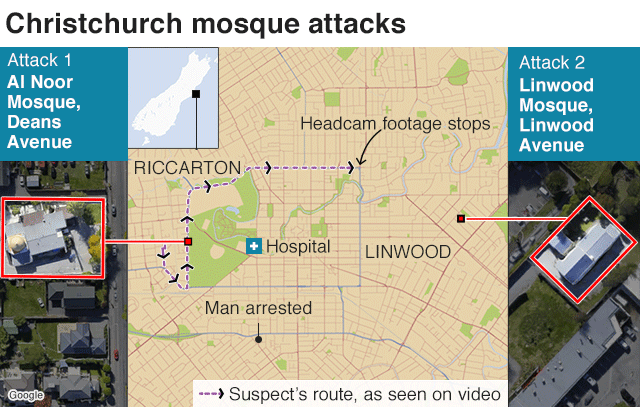 Ms Ardern called the attack "an act of terror". Ms Ardern, who had earlier described the shooting as a "terrorist attack", said the guns used by the attacker appeared to have been modified, and that the suspect's car was full of weapons, suggesting "his intention to continue with his attack". "The mere fact... that this individual had acquired a gun licence and acquired weapons of that range, then obviously I think people will be seeking change, and I'm committing to that." Still, there are lots of uncomfortable questions for the authorities here. The man now in custody, Brenton Tarrant, made no secret of his support for white supremacy. He had reportedly been planning the attacks for months. And yet he was not on any police watch list. He did not have any trouble getting a gun licence nor in buying a collection of high-powered weapons. On Saturday, New Zealand Prime Minister Jacinda Ardern said attempts had been made repeatedly to tighten New Zealand's gun laws, but all had failed. After Friday's terrible attack, she said, it must now happen. The suspect had "travelled around the world with sporadic periods of time spent in New Zealand", Prime Minister Ardern said, without formally identifying him. Ms Ardern said New Zealand intelligence services had been stepping up investigations into far-right extremists, but added: "The individual charged with murder had not come to the attention of the intelligence community nor the police for extremism." The text is called "The Great Replacement", a phrase that originated in France and has become a rallying cry for European anti-immigration extremists. The suspect said he had began planning an attack after visiting Europe in 2017 and being angered by events there. Daoud Nabi moved to New Zealand in the 1980s, and described the country as "a slice of paradise", his son Omar told AFP news agency. Prime Minister Ardern also spoke about the importance of reuniting relatives with their loved ones "as quickly as possible", and said that bodies were still being removed from the Al Noor mosque, the site of the first attack. Financial support would be made available to those who had lost someone on whom they were financially dependent, she added. A total of 48 people were wounded in the shootings. Among those injured are two boys aged two and 13. Eleven of those being treated at Christchurch Hospital are in a critical condition in intensive care, chief of surgery Greg Robertson said. Christchurch Mayor Lianne Dalziel expressed "revulsion" at this "act of terrorism" and voiced solidarity with the victims. "We have welcomed new people into our city. They are our friends, they are our neighbours." The gunman, who live-streamed the attack from a head-mounted camera, identified himself in the footage, which showed him shooting at men, women and children. According to the latest census figures, Muslims make up about 1.1% of New Zealand's population of 4.25 million. Numbers rose sharply as New Zealand took in refugees from various war-torn countries since the 1990s. One of China's most prestigious high schools has been the target of public anger after piles of expired mouldy food were found in its canteen kitchen.